What better way to celebrate your 60th birthday... than by refusing to grow old gracefully? 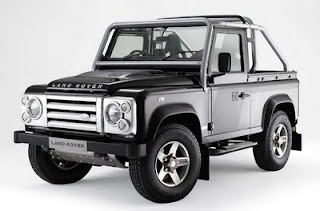 That’s exactly what the Land Rover Defender is aiming to do. In fact, the firm is hitting back at suggestions that it should pension off its mud-plugging legend by revealing the most thrilling version yet! 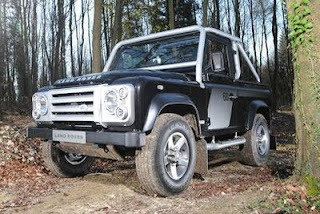 The SVX is essentially a standard Defender 90 with some cosmetic up-dates. It will be offered as both a station wagon and the soft-top version seen here in prototype guise. This is the first time the roofless model has been sold in the UK for 20 years, and Land Rover has come up with an all-new hood which is made from the sort of high-quality cloth you would expect to see on a drop-top Jaguar. It stows in a solid box beneath the boot floor. But the most obvious difference between the SVX and a regular Defender is the metallic black paint. Combined with a silver rollcage, tubular side steps and unique five-spoke alloy wheels, it gives the 4x4 a tougher look. Arguably the best bit of the makeover is saved for the front, where there’s a restyled grille with clear light lenses. Inside, Land Rover’s given the SVX new seats in an effort to address the Defender’s perennial problem of limited elbow room. It’s a minor improvement and the one-piece Recaro chairs are certainly supportive, although taller drivers will still feel too squeezed for comfort in the utilitarian cabin. This anniversary model also comes with a Garmin sat-nav unit and an iPod connection, while there’s a new audio system complete with a subwoofer in the centre console. It’s a nice touch, but a little redundant once you’re underway, because road, wind and engine noise will drown out whatever you’re listening to. On-road, the SVX is like other new Defenders as it’s noisy compared to modern SUVs and vibrates like a car from another era. The new six-speed manual is easy to use, and other controls, particularly the clutch, require less effort than previous models – only the high/low ratio transfer box is awkward to use. And let’s face it, if you’ve bought a Defender you’ll be using it, as this car is at its best off-road, and covers terrain that would defeat most modern vehicles. A £30,495 price tag ensures the SVX will appeal to a rarefied group of customers, but Land Rover shouldn’t find it difficult to sell the 300 cars it’s planning to build.